Let us earnestly and soberly ponder the week’s results. Stocks, for all the stalinesque propaganda, rose only 0.1%, well, 0.2% for the S&P500. US dollar index fell back today to close the week down 0.2%. For all the FOMC fomc-in’ and stocks a-burblin’ and dollar just a-thumpin’, the GOLD PRICE lost only 1.6% and silver only 1.9%. What about the white metals? Platinum lost 1.1% and palladium 2.4%. But all is not what it seems. In fact, nothing is. All is seeming. It’s like Ronald Reagan is directing markets. On Comex today, where they take no prisoners and show no mercy, the GOLD PRICE fell $5.70 to $1,141.50 and silver gained 2.2 cents to $15.566. Note, mark, and inwardly digest that during October the gold price rose from $1,114.20 to $1,141.50, a $27.30 or 2.5% gain. In the same 30 days silver flew from $14.506 to $15.566, higher by $1.06 or 7.3%. 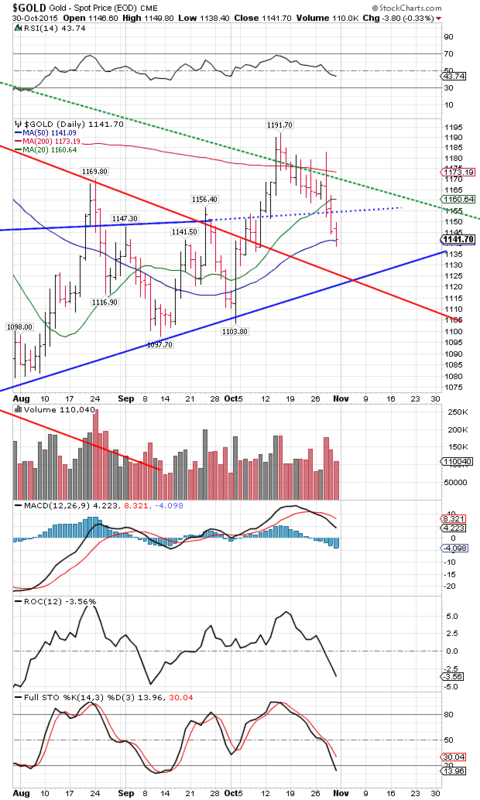 The gold price traded down to its 50 DMA and stopped there today, having closed beneath its 20 DMA on Wednesday. 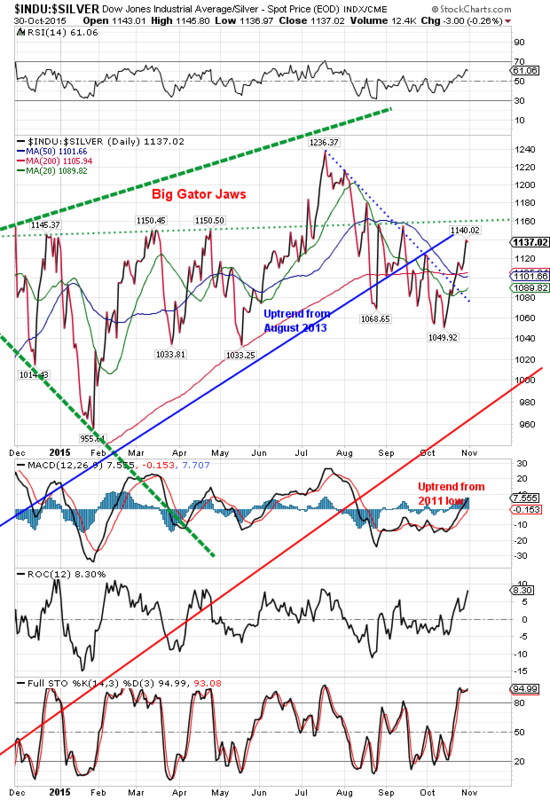 A 62.8% correction of the foregoing move takes it to $1,137.10. Today’s low came at $1,138.40. Downtrend line from the January high crosses the uptrend line from the July low about $1,122.50. Next week. However, the price of gold hasn’t yet signaled a turnaround. 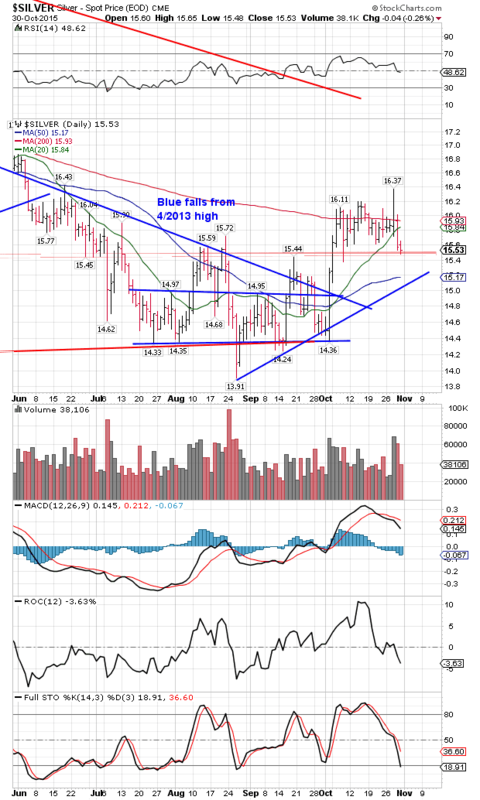 The SILVER PRICE has hit the old support at $15.50-$15.60 and stopped. Silver is holding up better than gold, which makes me nervous because silver’s Commitments of Traders look more negative than gold’s. Will silver even the score with gold in one swoop? On the other hand, a 50% correction of the October advance would be $15.365. 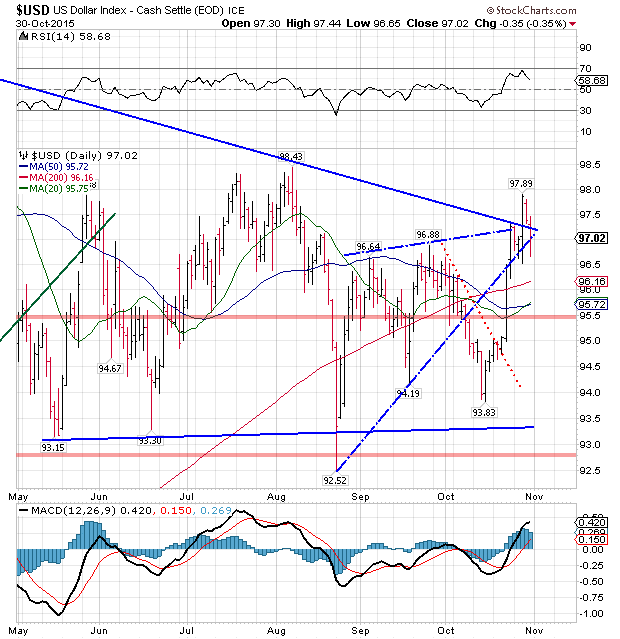 Down below at $15.00 is the uptrend line from the August low. For all the worrying, silver and gold prices remain in uptrends from the summer lows, and they had an excellent higher month. GOLD/SILVER RATIO remains where it ought to be if they are rallying, namely, below its 200 DMA in a downtrend. The end of the month was drawing close, and all good bureaucrats keep one eye on the calendar, because they are graded month to month. 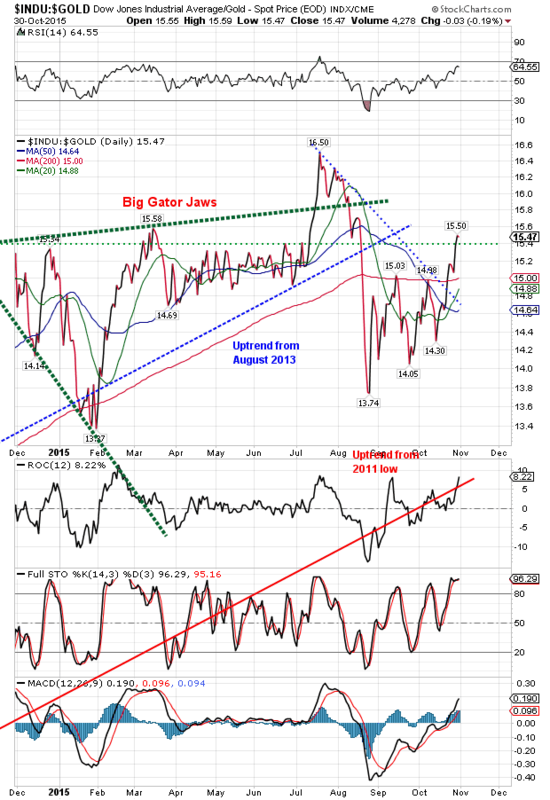 How to get stock prices up, especially before the FOMC meeting? The Chinese obliged by dropping interest rates on Thursday, Friday Draghi rattled his throat making noises about more QE coming in December, maybe, perhaps. Then the FOMC said they would definitely/maybe/probably/possibly raise rates in December. I’d say it was a brilliant propaganda campaign, and succeeded in pushing up the Dow 7.9% and the S&P 8.1% on the month, and helped erase the memory of the searing pain and bleeding from the August plunge. No new bolts were turned, no screws tightened, no new houses or cities or refrigerators built, nothing was produced, no economic demand grew nor economic supply, yet it SEEMED as if it had, because stocks were suddenly more valuable. ‘Twas all seeming, without being. But it worked. And what if the US dollar index is being managed the same way. Draghi says to Yellen, “You let your currency rise this month, and we’ll let ours rise next month.” Dollar has traded in a roughly 5 point range, even with the August drop, since May. Nice round number, five. Stocks today fell. 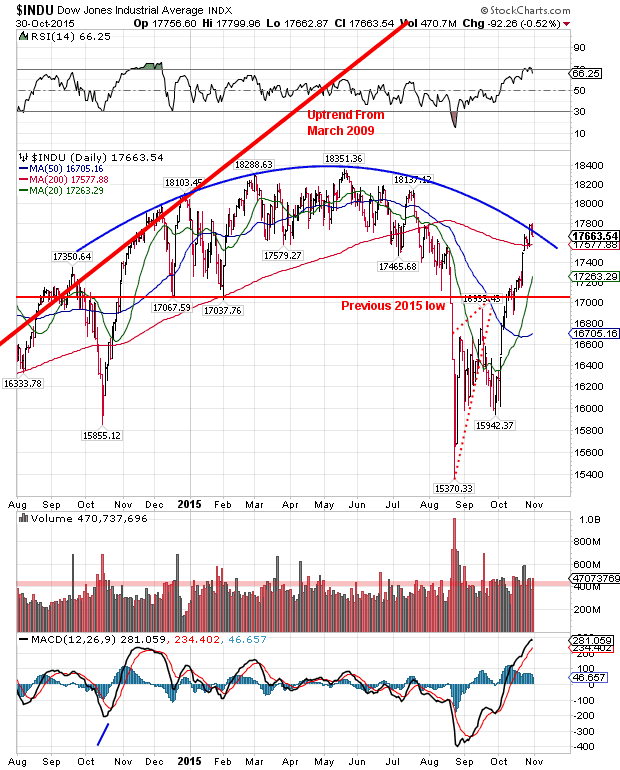 Let me eschew prolixity: the Dow and S&P500 have walked through their uptrend lines from March 2009, as well as spending the last twelvemonth forming an upside-down bowl top. They crashed through that bowl’s lip in August, rallied — thanks to the central banking miscreants — back to the bowl, and for the last two days have shrunk back like Vlad Dracula contemplating a crucifix at dawn. Dow Industrials lost 92.26 (0.52%) today to 17,663.54. S&P500 gave back 10.05 (0.48%) to 2,079.36. Get clear in your mind: If they can pierce the bottom of that upturned bowl the central bank magicians have engineered an extension to the stock boom. If not, stocks will move lower than a rich deacon stealing out of the collection plate. Dow in Gold and Dow in silver have suffered, thanks to the last week. Dow in gold reached the old top line (about 15.50 troy ounces) as it climbed through the 200 DMA, but today hooked down a tiny bit. Too early to say it has turned down. Dow in Silver rallied to a high of 1,140.02, but settled today at 1,137.02 oz. Also above the 200 DMA. Looks tired but hasn’t confirm that by lying down and going to sleep. US dollar index flaked today. After hitting that 97.89 FOMC-induced high on Wednesday, it traded back to the breakout line, a normal enough move. But today it sliced clean through that line like it had stepped through a trap door. Ended at 97.02, down 35 basis points (0.35%). Looks sick. Why did it cut into the bottom boundary of that rising wedge? Nobody wanted to go home long dollars. The euro, the Frankencurrency, rose 0.26% to $1.1007, but who cares? 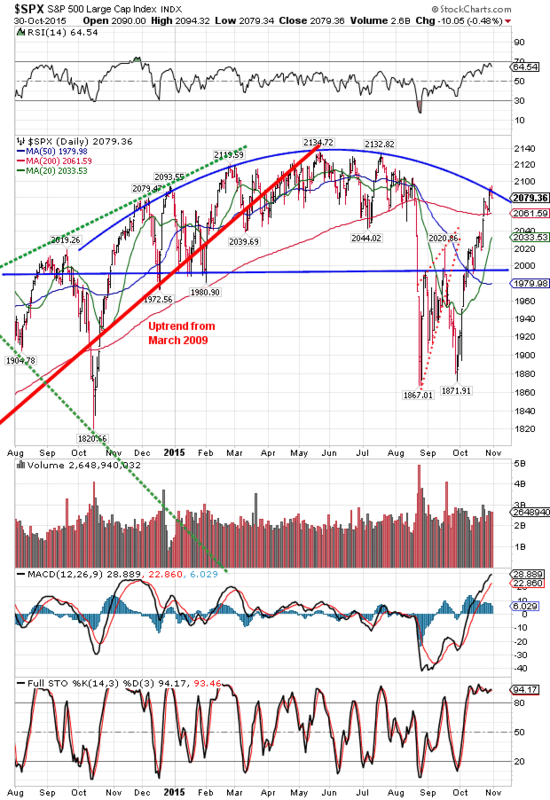 Now below its 200 dma and couldn’t buy credibility if it had its own central bank to issue money. Wait, wait. It does. Yen is tanglefooted in its converging 20, 50, and 200 DMAs. Range-trading.